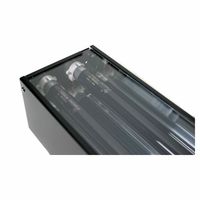 The Effects Master Energy III Series by Wildfire features three lamps, high efficiency universal voltage (120-277V/50-60Hz) electronic ballasting and polished Everbrite reflectors for maximum output and greater energy efficiency. 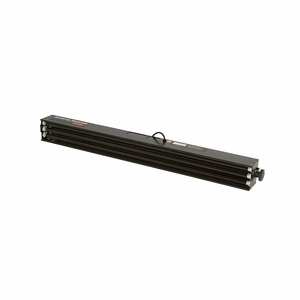 Perfect for those installations that require a larger number of fixtures per curcuit, or applications where you don't need the output of the Standard or Deluxe Effects Master models but still want a great effect. Made in the USA. UL Listed. Lamps sold separately. Protective lens kit allows the transmission of black light while protecting the lamps in your fixture. Designed for our Effects Master Energy, Standard and Deluxe 4' models. 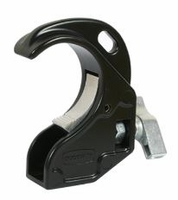 The Twenty Clamp features spring loaded trigger that holds clamp leaving both hands free to lift and position the fixture. 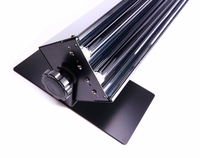 Perfect for Wildfire Effects Master Fluorescent and BlueBar LED black light fixtures. Fits 2" diameter tubes, TUV approved with a maximum load of 44lbs. 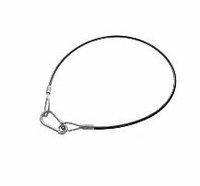 1/8" x 32" rubber coated braided steel safety cable. 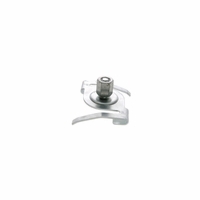 Enables mounting of Wildfire Effects Master series fixtures to a standard T-Bar Drop Ceiling.